According to this opinion piece by Scott Cowen, president emeritus and distinguished university chair of Tulane University, a full active work life will, of course, produce some failures. What counts are the lessons taken from them. 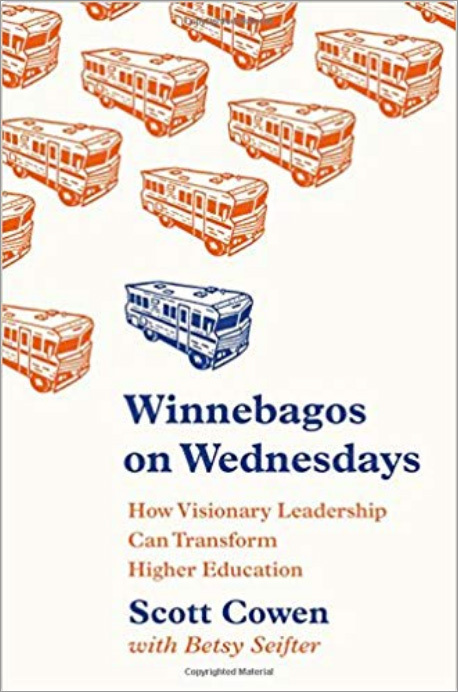 He is also the author of Winnebagos on Wednesdays: How Visionary Leadership Can Transform Higher Education. When Hurricane Katrina almost destroyed Tulane University at the beginning of the fall semester in 2005, after I had worked through the initial shock and distress, I was determined to reopen the university for the spring semester. We had less than five months to restore the campus and bring back students, faculty, and staff, but I was convinced we could do it. And we did. But the number of students who returned was lower than I had expected. What I had not realized was that the rest of New Orleans wouldn’t be moving as quickly and that the city was nowhere near where we were by the time we invited our students back to campus. The students wanted more than a fully functioning campus; They wanted a thriving community surrounding it. I had failed to understand reality, that is, a decimated New Orleans would likely have an adverse impact on Tulane for years to come. Filled with hope and wrapped up in our spirited and frantic efforts to reopen the university, I missed the opportunity to climb on the balcony and see the larger picture. A healthy dose of constructive cynicism (hope is not a plan) and a broader, more realistic perspective, that focused on weaknesses as much as on what is possible, would have served me better. On a general note, it’s crucial for organizations to not just look at the bright side and keep an open, critical mind. Change is the new normal and success is fleeting. In fact, the more successful an organization, the more likely the seeds of its destruction are being sowed. No leader or organization should ever fall into complacency. I once promoted a staff member who had been successful in her previous position at the university to a position on my leadership team. I liked the person and assumed she would do great given her previous track record. Lo and behold, things didn’t work out. The staff member’s competencies and skills didn’t line up with the requirements of the new job. Out of fear of conflict and awkwardness and because I was hoping she might grow into her new responsibilities, it took me a while to remedy the situation. Much time and energy were unnecessarily wasted. Fit is everything in building a strong team, and honest performance evaluations and feedback are important for developing your staff. Unfortunately, it is far too common for leaders to not take the time to help their staff members grow as leaders, and they rarely undertake rigorous succession planning, which typically results in outside hires. This increases the chances of bad fit, which means the organization may end up with someone in charge who shouldn’t be because no one has the courage to confront the issue. It is ironic that we often shy away from challenging situations for fear of failure when it is exactly our inaction and indecisiveness that will bring about failure. In 2003, I had the chance to move Tulane athletics from Division I to Division III, but once the news of our discussions became public, all hell broke loose. I was met with hate and disdain at an unprecedented and, quite frankly, frightening level, which involved me being hung in effigy outside of my office. The board got skittish and critics of the proposed move started making promises that suggested we could turn the current situation around if given a chance. I also started to wonder whether I would be able to get anything done, assuming that I was able to keep my job, if I were to go through with the plan. I acquiesced and kept things the way they were although I had serious concerns about whether the status quo made long-term sense from an academic, financial and strategic viewpoint. The facts were pointing us in a different direction, but I couldn’t bring myself to go there. This decision, or lack thereof, has haunted me to this day. I do pray that the critics were correct, but I have spent more time second-guessing myself on this decision than on just about any other decision in my presidential career. Oftentimes, making no decision is akin to making a decision, but all you’re doing is perpetuating the status quo. Effective leaders have the courage to make tough decisions based on hard facts and a point of view about the future. They are OK with not being liked all the time and by everyone (I’ve grown a very thick skin over the years). If everyone likes you, chances are that you have not made any tough decisions. If I ever had a tendency to block out critics and naysayers, it must have been before my time as university president. The academy’s unique model of shared governance ensured that I considered varying viewpoints before any major decision, and I learned to appreciate the process of respectful debate because it ultimately led to the right decisions. But I have come across many leaders who prefer talking over listening, who consider themselves the smartest person in the room, and who reach decisions based on their feelings and wants. Disagreement is not only the hallmark of democracy, it is a fundamental of great leadership. Disregarding different and opposing perspectives can block the emergence of ideas and solutions. Leadership should never be about one person’s agenda; it’s about facts, mission, vision, values, and principles. Consequently, it is of great importance to seek inclusive dialogue. I have seen leaders fail because they didn’t take the time to show people who they are. Letting your followers get to know you requires showcasing your strengths while also exposing vulnerabilities. People will not only support you when they embrace you as a person, they can help guide you in your decision making and growth. The most effective leaders understand that leading involves learning, and they encourage feedback from people around them to work on their weaknesses. I believe in the power of authenticity and emotional intelligence — it helped me a great deal when I was trying to instill hope and faith in the future of Tulane against all odds after Katrina. Self-awareness, one of the key characteristics of high EI, is a quality that can distinguish a good leader from a great leader. If you don’t know who you are, if you don’t know what your strengths and weaknesses are, you will have a hard time gaining people’s trust and growing as a leader. Many leaders tend to stay past their best-buy date. Even the most extraordinary leaders reach a point where they no longer have what it takes. They may have lost their energy, motivation and drive or their skill set no longer meets the demands of an ever-changing world to continue to move the organization forward. Whatever the reason, staying on when one’s leadership is no longer in the best interest of an organization is a fatal and common mistake. I stayed at Tulane as president for 16 years because Hurricane Katrina confronted me with a challenge seven years into my tenure that required a longer-term commitment. Without such a bona fide crisis, I probably would have left after 10 years. With the occasional exception (Norman Francis, whose presidency at Xavier University in New Orleans lasted 47 years, being one such exception), I believe that it normally takes about a decade to achieve transformative, sustainable change. Any existing problems after that are likely of your own making or you aren’t able to solve them. Change is not only normal but also healthy, so a leader’s decision to step away after certain milestones have been achieved and his or her level of incompetence has been reached (think Peter principle), is in fact an act of great leadership. I wholeheartedly believe that experiencing failure can be the source of exemplary leadership, but the common leadership failures outlined in this article should be seen as cautionary tales. By better understanding how we can fail, we are ultimately learning how to succeed. With a healthy dose of self-awareness, an open mind, and the courage to see what’s really going on and what needs to happen, leaders can avert failure and continue their winning streak.